The American Prize in Arts Marketing recognizes and rewards the best marketing campaigns by performing arts organizations in America, based on submitted applications from professional or community groups. B. BY MAIL & EMAIL: mail the completed, downloaded application form, send hard copies of marketing materials, campaigns and/or philosophy, send discs of any broadcast materials to the office, and email the required information (see application form); paying fees online, or by check, by money order or credit card. 1. Download the application form for The American Prize in Arts Marketing. Select the category which best identifies the applicant. 3. If completing the application ONLINE, provide marketing materials as PDFs and include links to broadcast materials in your required email (see application form.) Be sure to identify any links by applicant and provide any passwords necessary, so judges can easily access your audition. Links must remain active until results in the category are officially announced. PLEASE NOTE: The responsibility for the viability of links rests with the contestant. Please double-check that they work correctly. 4. If providing audition selections BY MAIL, include two collated hard copies of marketing materials and two identical discs of broadcast materials clearly idenitifed on both the recording itself and on the recording's cover or box. Be sure it lists applicant's name. The application fee is $55 per application. Pay ONLINE (click "FEES/GIFTS" in the menu bar, above) or use this iink: "Pay competition fees" pay by credit card, or make checks payable to HCMT/The American Prize (see application form.) Application fees are nonrefundable. No incomplete applications will be accepted. When paying online, BE SURE to identify the applicant with the payment. 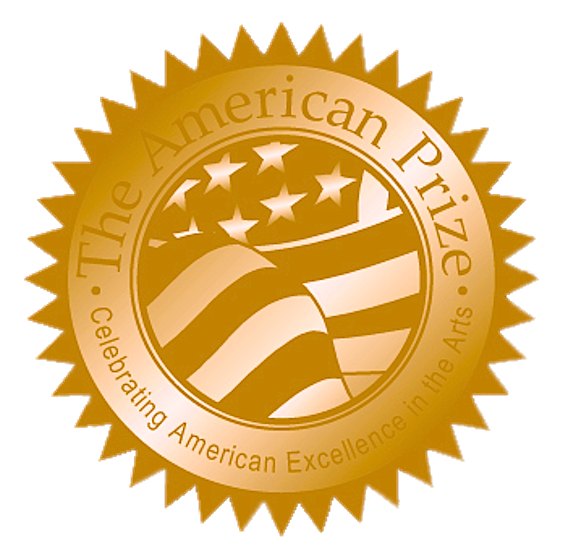 The American Prize in Arts Marketing: Send as PDFs or as hard copies marketing materials from your campaign, including, but not limited to, tear sheets, print ads, broadcast scripts, brochures, programs, media advertisements, links or print-outs of website or blog pages related to the activity, links or dvd recordings of any television, film, internet or radio spots from the campaign. Please include any in-house materials created for staff or volunteers, as well as information concerning the campaign's success. Campaigns may focus on an entire season of performances or on a specific event. For the 2019-20 contest, materials may be submitted for any campaign that occurred during the five years encompassed in the seasons 2014-2015 through 2018-2019.
of campaigns that combined inspiration and creativity with demonstrable success, regardless of the budget available. We welcome statements from administrators that outline challenges the campaign sought to address, goals to be met, assessment procedures used, and analysis of success, as available. There are no other restrictions. No materials will be returned.